NEWLY promoted Hearts stormed to the top of the Ladbrokes Premiership last night with a clinical 2-0 victory over Motherwell at Tynecastle. 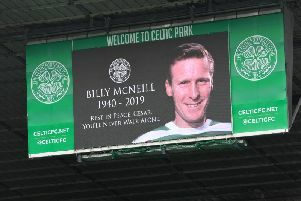 They took advantage of Celtic’s slip-up at Rugby Park, where Kallum Higginbotham’s late penalty earned the home side a 2-2 draw with the Champions. A Gavin Reilly penalty after 32 minutes and a 64th-minute strike by Billy King took Hearts to the pinnacle of Scottish football with three wins in three games in their first season back in the top flight after relegation following administration. Hearts head coach Robbie Neilson sought to play down comparisons with the George Burley era, having himself been a member of the side whose electrifying start to the 2005-06 season saw them win their first eight league games. “It’s still a long way to go before we can match the run George achieved,” said Neilson. “That was a different era and a different side, it was an experienced side. “Our team is young and play differently and are managed differently. But there is still a long way to go as we are only three games in and we can’t be getting carried away with ourselves. Hearts now have games to come against Ross County away on Saturday and Partick Thistle at home a week later. “We have spoken already about getting geared up for Saturday against Ross County,” said Neilson. “We haven’t spoken about results or anything else. We need to try and win that game and move on again. At Rugby Park, Leigh Griffiths put the Parkhead side in front after three minutes but Josh Magennis equalised just before halt-time. Nir Bitton’s superb strike looked to have earned the win for Celtic but Emilio Izaguirre brought down Killie’s Greg Kiltie in the box late on and Higginbotham chipped the spot-kick home. Having watched previously pointless Killie grab a draw, Hareide added: “It is the same for us, when we play teams lower down the league, they always lift themselves when they play the big boys. Celtic rested a few players and they have more in hand, I have seen them a lot and they are a good side. Inverness Caley Thistle and Partick Thistle drew 0-0 at Caledonian Stadium.